Five different players found the end zone for the San Diego Cavers (11-1) as they rolled past the Kearny Komets (11-2) to clinch its first outright CIF Section title since 1959. After a fumble recovery by Raiden Hunter on the opening possession set up his own touchdown run, Kearny struck back with a 50-yard touchdown pass from Kenyon Williams to Hayden Lundy to tie the game 7-7 early in the first quarter. 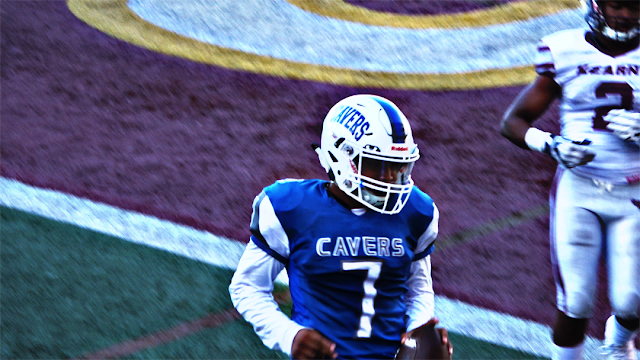 Jayden Wickware's goal line dive gave San Diego a 14-7 lead in the second quarter, but the Cavers pulled away with a 21-7 halftime lead after senior lineman Jaliel Jackson returned his own blocked pass 50 yards for a pick-six as time expired. A 21-7 run in the second half sealed the game and advances San Diego High to its first State Regional appearance in program history.